Welcome to my little review of some goodies that I got my hands on from BodyJewelleryShop.com! I'm always after cute jewellery to wear in my ear piercings. The Body Jewellery Shop has plenty of cute jewellery and I was pretty spoilt for choice. I chose 1 pair of earrings for my lobes and 2 labret studs for my conch piercing. The pair of earrings that I chose was a pink glitter pair. 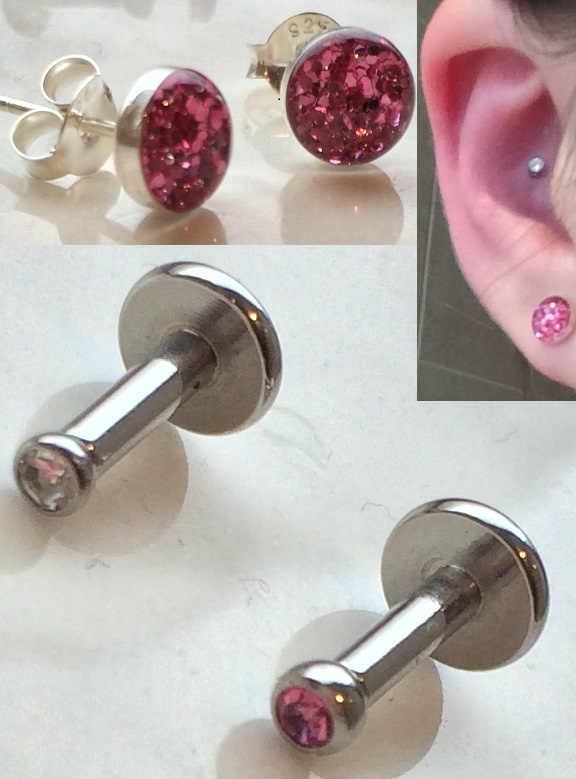 I chose a pink interally threaded jewelled labret stud, and a clear interally threaded jewelled labret stud. They are all so reasonably priced, the pair of earrings costed just £1.99 and the labret studs were £3.49 each. Pretty amazing prices! The labret stud fit into my piercing perfectly and it's very comfortable to wear, as are the earrings. They're amazing quality as well! The labrets are kinda small and tricky to insert but it's easy once you get the hang of it and they look so delicate and pretty so I definitely wouldn't change the size! If you need some cute, good quality jewellery for your ear piercings then definitely head to BodyJewelleryShop.com. There's a great selection and the jewellery is as beautiful in person as it is online.